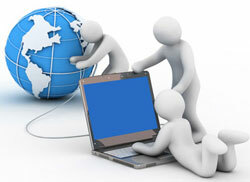 Keyword research is the fundamental building block for a successful Internet Marketing campaign. 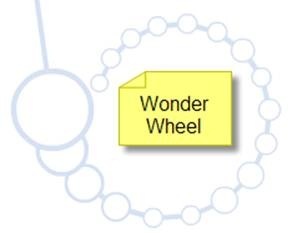 Google Wonder Wheel is yet another free feature from Google. It Internet Marketers build up a keyword list that would usually be difficult to think of from the top of your head. 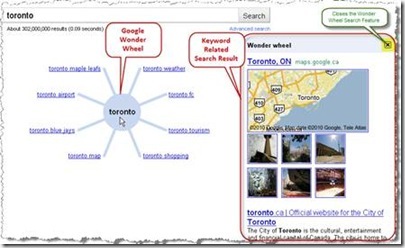 Once your primary keyword is entered, this Visual search feature helps to explore the keyword. Click on the ‘More search tools’ Option on the right hand side of the Google webpage. 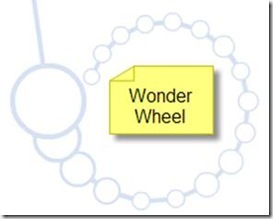 The box expands, and you can select ‘Wonder wheel’ under the ‘Standard View’. 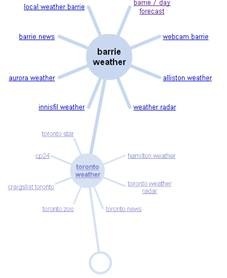 Here you can see our keyword ‘Toronto’ circled by other related keywords. To the right side of the window, one can see the normal Google search result for ‘Toronto’. If one of the surrounding keywords are of interest to you, click on it and get the result. A new branch of keywords will be generated, which will be encircled by a new keyword list. The search result will also change accordingly. The picture of bubbles below indicates the pathway of our search which appears on the search page. 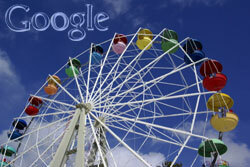 The ‘close’ button allows you to exit the Wonder wheel feature and proceed to the normal Google search. 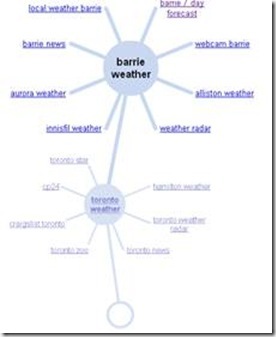 It serves as a Niche Keyword Research tool. If you are a frequent blogger or writer, this feature helps as a tool for exploring your topic. This free feature from Google will serve in exploring the topics that you have not ventured into. This feature has been available on Google since March 2009. If you have not used this search feature yet, go ahead and try out this cool feature from Google. Even though Google wonderwheel has been around since 2009, I have not noticed this wonderful little flash based interface "google wonderwheel". Thank you jackson. Interesting tool and the graphical representation will attract more users and helps to find related keywords in a fun way. I liked the way it loops through ! Thanks Jackson.